Have you heard the latest winter weather prediction? Apparently, our (western Virginia) wet summer weather pattern will extend into winter. 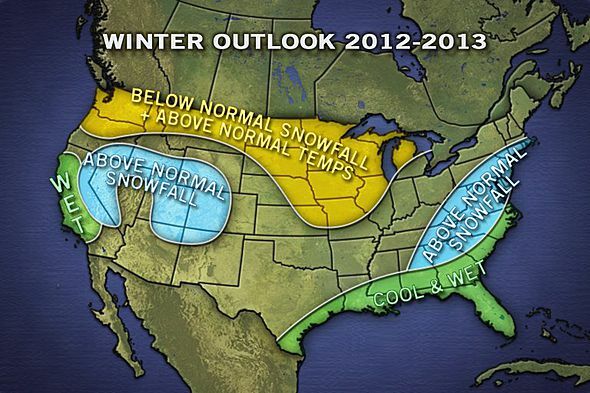 I don’t know what “above normal snowfall” means, but hopefully it won’t be the 6 feet we got a couple of years ago. Then again, we had a severe snow drought last year and now I’m almost looking forward to some decent accumulations. Added bonus: I now have 4-wheel drive and don’t have to drive over a mountain to work every day. How bad could it get? It is just Virginia, after all. Could it be I’m actually looking forward to winter this year? After I recently mocked a Canadian blogger’s longing for cold arctic winds in her face? I might be swayed now, but ask me again in February. In the meantime: it is still summer, and I still have much to do outside. My yellow squash is spent, so I’ve let those plants die back. The zucchini plants are still humming along, and I noticed a bunch of new buds this morning. Hopefully I’ll get another crop, if the vermin don’t get to them first. I suspect the groundhogs have been eating high on the hog this summer thanks to all my efforts. Now that I’m thinking about winter, it’s time to get on my final house projects of the year. I hate to do it, but I’ll have to put my paintings aside for a couple of weeks and get back to construction. My goal for this weekend is to build a stoop for the back door. I don’t have the supplies (or money) to start my roof repair, but I need to get to that soon…before morning temperatures drop too low and I lose any gumption I have left. Realistically, I can just concentrate on the deteriorating section up front and worry about the rest in time. However, it would be nice to find and patch the spot that is leaking over my bed. Then again, I can just tape over the plaster and leave it for another year. Seems to have worked so far. Yup. Maybe just the front section will do for now. My neighbor now disputes that the fallen tree in the back of my lot is hers, so I guess I’ll have to take care of that myself. I could argue my point harder, but it won’t make the tree go away any faster. It’s pretty small, so I’ll just chop it up the best I can and figure out how to dispose of it later. It’s at the top of my Chores-I-Really-Don’t-Want-To-Do list, so – like my roof – it may just wait until next spring. Now that I’ve talked myself out of my important projects, I might as well go back to painting. And creating a work space. I originally thought I’d convert part of the basement into a studio, but I just don’t have the money these days. Instead, I’m going to turn my rarely-used guest room into a work space. I’ve started clearing out the bookcases (which will be disassembled and stored) and will rearrange the furniture to give me optimal working space. I’ve never had a designated creative space before, and I’m truly excited. Pictures to follow!